Itoi-Signed MOTHER 1+2 for Sale! Last week I posted some neat MOTHER 2-related swag on eBay, and this week I’m listing something even more epic: a copy of MOTHER 1+2 signed by none other than MOTHER/EarthBound series creator Shigesato Itoi himself! I’m also including a bunch of other really rare items from the official MOTHER 1+2 event held in 2003, check it all out here! Here’s Itoi signing boxes prior to the event – as far as I know this is the only one that’s ever been made available outside of Japan. I also took more photos than even Mr. Fuzzy Pickles would have – see them and all the juicy details here! That reminds me that someday I really need to sit down and subtitle the whole talk show portion of the event. Most of the cool info is in the video above, though. Anyway, I have more interesting stuff (some from this event and some not) I’m going to auction off down the road, so keep your noses peeled! In the meantime, you can check out some of my other EarthBound/MOTHER goodies here! 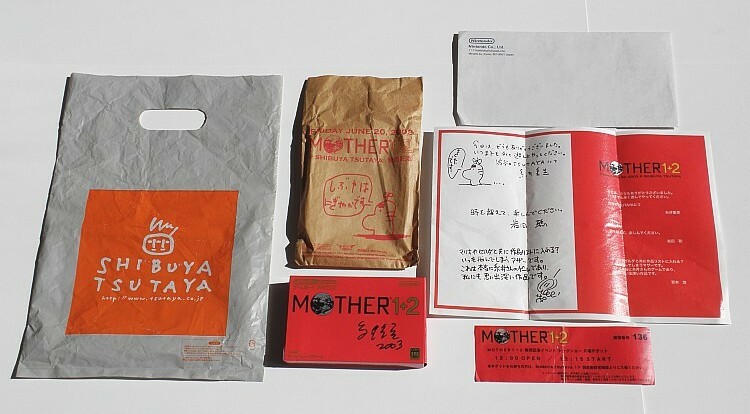 18 Comments to Itoi-Signed MOTHER 1+2 for Sale! A dream come true for a MOTHER fan! This does remind me I should probably sell my games. If only I could remember what happened to the boxes… In an odd turn contrary to the spirit of the topic at hand, I blame my mother for their disappearance. I think this is one thing that I wouldn’t sell! Oh gosh that’s conna cost more than a sealed copy of Earthbound, I can tell. How many cars will I need to sell to get it? Wow… in just one day the price went from $16 to $510… im never gonna get earthbound. The price of it latley was going on the rise! I would like to meet the creators of EB and ask how they made up some of the things in the game, such as Moonside. I really wonder how they made up that twisted wonderland. Also a thought. There are fake cartriges of EB and EB0. How many designs are there to be found on fake carts? what signature, all I see are 4 pubic hairs. So, it goes up to $510 and 32 bids in the first day, then isn’t touched for the next 4 days? Me thinks someone is bidding on their own auction. LOL SushiGummy, Mato is very reputable and there are like 10 or so different bidders for it. This usually happens whenever very rare Earthbound merch goes on sale. The price skyrockets on the first day, and then the rest of the bidders close in on the final hour. No one bids before then, because they don’t want the final price to be too high. SushiGummy: Nope, there’s no trickery involved. It did that by itself. It’s as Bionic says. 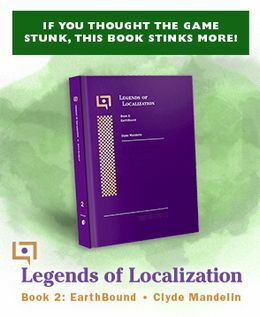 Bionic: I think I’ll translate it for a future update, actually. Thanks for the idea!